Total distance: 1344 km (840 mi); total altitude gain: 11 km (36000ft). Tour date: second half of August 2001. Day 1. Since my flight arrived in Boston in the evening, I had pre-booked the night at the Anchor Inn in Boston's nothern Revere suburb. It turned out to be a cheerless and loud motel. I left Boston on route 1A, which is busy and ugly in Boston but gets much quieter. The shoulder is often very wide, but the road must constantly be watched for potholes, gaps, debris, sand drifts, and vicious sewer grates. (This was true for all of New England.) Drivers leave plenty of space when passing, and one stopped to let me cross A1. This happened twice more on the same day, and several times people stopped and asked whether I needed directions when I was checking my map. Either New Englanders are space aliens impersonating humans but haven't figured out the Jekyll/Hyde transformation we undergo when driving a car, or I am in bicycle heaven. I passed through and visited both Salem and IP Switch, shown on the right. Oops, make that Ipswich - computer people like me are just bound to misread a town sign reading "IPSWICH". I then left Massachusetts, passed right through the rather predictably tourist-infested New Hampshire coast section, and rode some distance into Maine. New England states are really tiny compared to California, which takes weeks to cross. 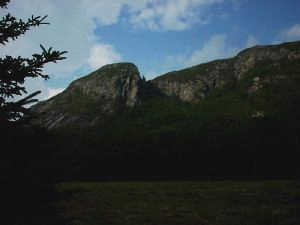 I stayed at the Cape Neddick campground, which is loud, filthy, expensive ($30), and had no hiker/biker tent sites. Day 2. Cancel the bicycle heaven, I had continuous rain or drizzle all day. This doesn't happen in any heaven I have read about. I followed route 1 to Kennebunk and decided to get away from all the tourist villages at the coast. 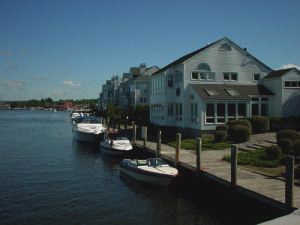 I skipped Kennebunkport too, which is a favorite vacation spot for president Bush, but according to a local who advised me not to go there, Bush's judgment is usually flawed. 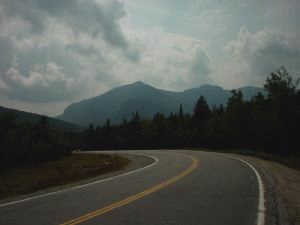 So, I rode route 35 to Hollis Center, 117 to Cornish, 115 to Fryeburg, and 302 to Conway, where I stayed in New Hampshire's only hostel. 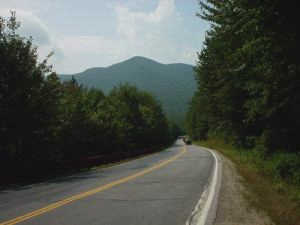 Routes 35 and 117 are mostly nice quiet roads through the forest, with lots of short steep climbs. Routes 115 and 302 are busier but flatter. The hostel is very pleasant, unlike all those faceless motels along the road - recommended! According to others I met, I had only seen the ugly part of Maine, and the south-eastern coast and the north are much nicer. 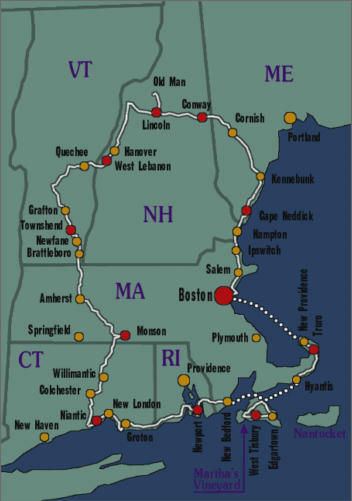 I thought I didn't have enough time for such a long ride though, although later I decided I should have spent more time up north than at the Rhode Island and Massachusetts coast. I should probably also have spent some time north of Conway instead of continuing west the next morning. Day 4. After Lincoln, route 112 first rises gently and then rather steeply at 11%, but gains only 350m. From the summit it's mostly downhill to route 10, which I took all the way to Hanover. 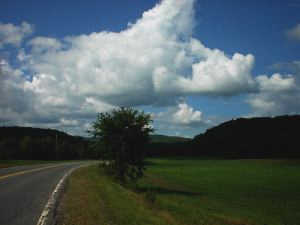 Route 10 follows the Connecticut River but one can see it only rarely. Hanover is so dominated by Dartmouth College that downtown seems as if it were added as an afterthought. Baker library in the main building has free Internet access on iMacs, even supporting SSH (which I need to log into my home system). Hanover's Thai restaurant is excellent. I stayed in the Sunset Inn, 3km south of Hanover in West Lebanon, which has reasonably priced rooms in this otherwise expensive area. 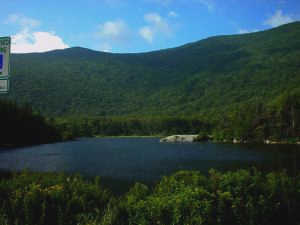 The left picture above is the last one from the Kancamagus highway; the right one was taken along the Connecticut river. Day 5. I turned into route 4 west in the center of West Lebanon, and followed it to Bridgewater, where I turned right into route 101A. On the way on route 4, I stopped at the Quechee Gorge to look at the dam and river, following a short trail. I then followed route 100 to Ludlow, 103 to Chester, and 35 to Grafton and Townshend. Routes 4, 100, and 103 are rather busy, but 100A and 35 are quiet and beautiful. Unfortunately 35 is very hilly, including a 300m stretch over 14%, and after Athens there is even a steep 1.5km section of barely ridable unpaved road. 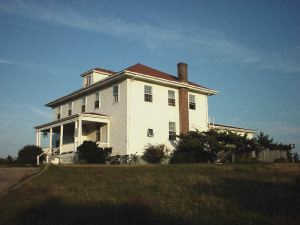 Most houses along that part of route 35 seem abandoned. I first wanted to stay in Grafton, a beautifully restored historical town, but it was totally deserted and I couldn't find accomodations. I ended up in the Townshend County Inn, south of Townshend on route 30. According to my observations, at least half of all shops I saw in Vermont sell antiques, mostly furniture. The density is astounding. I wonder where such a sparsely populated state gets so many antiques from? Day 6. 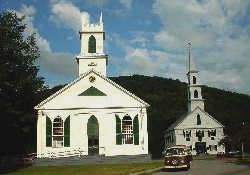 My next stop was Fenshaw, a prototypical New England ensemble of a white church plus a white city hall plus a group of white mansions etc. Like Grafton, only slightly less devoid of people. The teaser image at the top of this page was taken here. I then rode on to Brattleboro, which has an excellent co-op supermarket at the south end. There aren't many accomodations there, but I found a campsite sign south of Palmer. I had to climb some 150m to the Partridge Hollow campground. 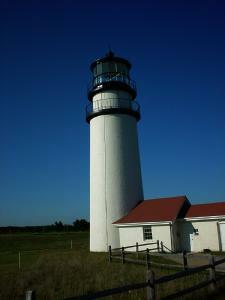 Unlike the campground at Cape Neddick, this one is pleasant and has a quiet tent-only area. They also rent videos, for people who love the outdoors and being in touch with nature and park their campers, fully equipped with VCRs for the purpose, in this campground. Some people must have a bubble in their brains. The lady at the campground told me that the local motel is not very good. In fact she didn't use the word "motel", she referred to it as the "fleabag". Day 7. 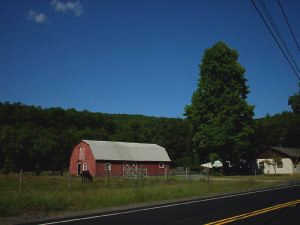 I entered Connecticut on route 32, and followed it to Willimantic, halfway to the coast, then route 16 to Colchester, 85 and West Drive (on the other side of the freeway, it has very little traffic), and routes 82 and 156 to Hamburg and Old Lyme. I chose this circuititious route to avoid all large cities, and it no doubt added a lot of hills. 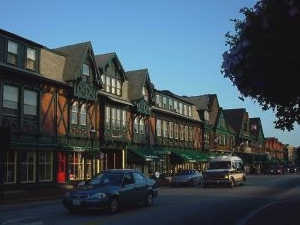 This whole part of Connecticut feels like one giant suburb - widely spaced mansions everywhere, with the occasional farm or little forest in between. 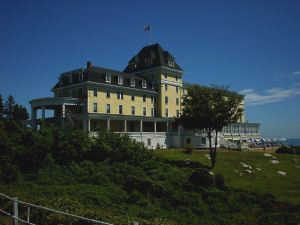 Finding a hotel on a saturday evening was hard - I stayed at the Niantic Inn in Niantic, some 10 miles along the coast on route 156. Rather expensive ($110) but well worth it. Day 8. I went through New London, just east of Niantic, Groton (shown to the right) and Mystic (shown to the left below) into Rhode Island. To get off the main highway, I used route 1A to some scenic beach resorts, and then got lost where the map showed I couldn't possibly get lost. When I finally got back on route 1, I followed it all the way to Narragansett, where I inquired about the bridges to Newport. It turns out that only the first (to Jamestown) but not the second (to Newport) is legal for bicycles. There are buses with unknown schedules and a ferry with a known schedule, so I decided to run for the ferry. I had less than an hour, and missed turns because direction signs were missing in my direction. For example, they show whole towns as tiny dots, and if there is a T intersection at each end of town, they'll collapse that into a four-way intersection under their little dot. Many streets are not shown, or given no name or a wrong one, or streets are shown that don't actually exist. In America, you cannot use directions like "3rd intersection left" because the number of intersections on the map has absolutely no relationship to the number of actual intersections. I have frequently been reduced to navigating by compass and dead reckoning of distances. What a mess. As usual, the terrain found room for some hills even along the coast. But I made it, found a cheap room at the Motel6 north of Newport, and dropped my bags there before going back to Newport for some sightseeing. Lots of tourists and bumper-to-bumper traffic everywhere. Nice mansions, but the overcrowding made me flee to my hotel. Besides, those mansions are huge for a private home, but puny compared to castles along the French Loire river, for example, and I couldn't really muster enough interest for them just because they were in New England. 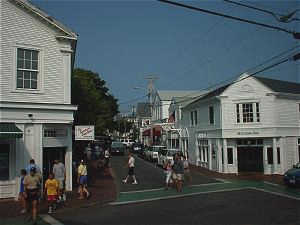 The left picture below is a beach resort at the tip of the peninsula south of Groton, and the right shows a shopping street in Newport near the mansions. Overall, I suggest that you stay away from Rhode Island - there is little to see here, and the traffic and rampant commercialism makes it a waste of time for a cyclist. The unreal good manners of drivers towards cyclists I was talking about earlier don't exist here either. I was later told that I have chosen a poor route; see the end of this page for links that may help you finding a better one. Day 9. I took routes 114, 117, and 6 to New Bedford in Massachusetts. Riding remained unpleasant. I later found out that the bridge to Tiverton, north of Newport, is not legal for bicyles, I was expected to ride a huge detour through Bristol. New Bedford is a depressing, smelly industrial town with no redeeming qualities, other than that the ferry to Martha's Vineyard leaves here, at the southeast edge of town. Look for a white ferris wheel just outside the dam wall. My recommendation: take the (seasonal) ferry from New London to Martha's Vineyard to avoid Rhode Island. Ferries leave New Bedford at 9:30, 13:15, and 17:15, and take 90 minutes to Oak Bluff harbor on Martha's Vineyard. 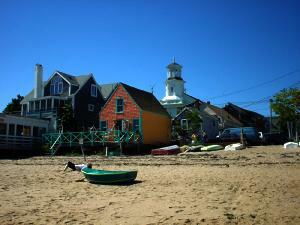 I rode south along the coast to Edgartown. It's the usual little pretty crowded tourist village, shown in the picture to the right, including the inevitable endless bumper-to-bumper traffic jams. How, and why, does such a small island attract so many cars? There are nice bike paths though, so all those canned lemmings didn't get in my way. I stayed in the beautifully located and very pleasant hostel in West Tisbury, some 15km west of Edgartown, a few houses east of the fire station (the bike path bypasses it, so I missed it at first). Day 10. The next morning I rode the western loop to Menemsha because the Hyantis ferry from Oak Bluff doesn't leave before 11:00. Not much to see there. I didn't have the time for Gay's Head at the western tip of the island. Since yesterday I rode about 75km on Martha's Vineyard. Just when you think it can't get any worse than Rhode Island, it will. After the quiet rural roads of Martha's Vineyard, the desolate endless strip mall that is route 28 up Cape Cod's coast is just depressing. 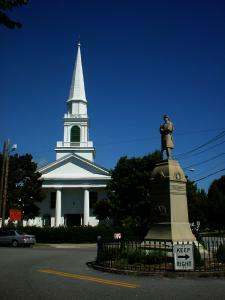 At Chatham it goes upscale and very touristy. Then it turns straight north (and is called "28 south") and runs in a less offensively developed forest for a while, until it turns into "6 east", also straight north. Traffic is fast and extremely dangerous. The idiot quota of drivers who will pass close and at high speed approaches 100%. You must block a lane here and force cars to switch lanes or wait. There is no shoulder but dangerous sewer grates. I amused myself with estimating the age of the ample roadkill by its flatness, and wondered how the equipment formerly held together by the huge screws and bolts I kept seeing on the road is doing today. Rattle, I guess. I later learned that there is a bike path called the Rail Trail winding its way north, but it covers only half the distance. Still, it would probably have avoided much aggravation. The hostel in Truro where I spent the night (and where I am writing this) is right at the coast and very basic and tranquil, as shown in the left picture below. The manager wondered why female beds are all booked until the end of the season but there are plenty of male beds available. Perhaps it has something to do with the crowded basement rooms with bare concrete floors? Nice beach though. Day 11. The ride on 6 to Provincetown (P-town) continues, except for a little quieter detour on 6A, which sports countless motels and cabins. If you are considering a vacation there you'll be happy to learn that they all have cable TV. P-town itself is rather nice, as these tourist havens go - in fact the visibility of alternative lifestyles is rather more than I expected in such a major US tourist destination. 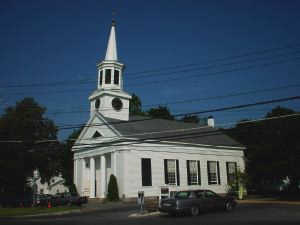 The town consists mostly of Commercial Ave along the shore, centered to the left of the tall pilgrim memorial tower. The Mayflower pilgrims are a big thing here because this is where they first arrived in America, before they found the place as desolate as I did, and continued to Plymouth. The right picture above shows the beach at Provincetown. I didn't want to go to Plymouth because I have had rather enough of the Massachusetts coast, and I had been warned it's just more of the same. Unfortunately the 11:00 ferry to Boston I wanted to use doesn't run on Wednesdays, so I spent some time at the West End beach opposite from P-town. The 15:00 ferry finally brought me to Boston, the final stop of my tour. Day 12. Riding a bicyle in Boston is difficult because of construction, traffic, and confusing one-ways. Boston is a walking city. Pedestrian traffic lights are the pushbutton kind, so consequently they are totally ignored and everyone walks whichever way they please. 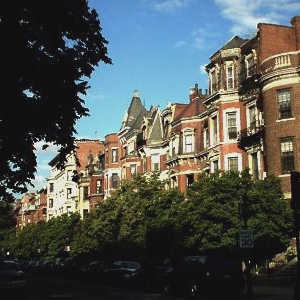 Boston has a few of the run-down dirty concrete canyons so typical of American inner cities, but Boston is also beautiful, with its Common park and many lovely small parks and tree-lined avenues of brownstones in the city. The "freedom trail", marked with a red or brick line on the sidewalk, is a good path to follow, even if you don't care for the sights. Faneuil Hall and the Common served as focal points for me, but you haven't seen downtown Boston if you haven't seen the Italian North End, residential South End, and Commonwealth Avenue. The Lonely Planet guidebook has more. 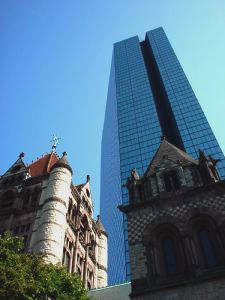 The pictures above both show Boston. I think that the left one, taken on Commonwealth Avenue, characterizes Boston better than the right one, taken at Boylston Avenue. I got to the airport with the blue T metro line, and over an access road and a sky bridge from the hotel parking lot. I later talked to a policeman, and he said there is no legal way to enter the airport by bicycle, so I must have done it illegally both arriving and leaving. I have not seen any road signs that limit bicycle use on access roads though. Here are the tour statistics. 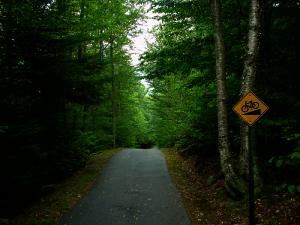 As you can see, it didn't make very much of a difference to the daily altidude gain whether I was riding in the White Mountains, along a river, or inland - New England is a constant sequence of small hills, usually some 50m high. Only the coast was flatter. I don't know how precise the kCal readings are, but I did notice that after a few days in New England's hills, my heart rate barely went up when climbing hills. The numbers may serve as difficulty indicators. The average daily cost of accomodations: $55 ($14-$30 for campsites and hostels, $70-$110 for motels and inns). Getting rooms and sites was never hard because I started looking early in the day and I was outside the major peak days, such as the Labor Day weekend, but most places where I stayed later filled up to 100% later in the evening. GSM (and other) cell phone coverage was pretty much nonexistent inland, but coverage was ok near the coast, and marginal on Martha's Vineyard. A word about my choice of accomodations: I use campgrounds because I like sleeping out under stars, but the New England campsites I have seen, even the ones with tent-only sites, are far too car-oriented to make this really pleasant. In August I also had a real mosquito problem. I like hostels because I can talk to other travellers, sharing information and experiences. For example, I am glad that I was warned about the coast, and rearranged my plans to stay in the mountains longer. Motels allow privacy and convenience, but they are anonymous and, of course, more expensive. It was sunny about half the time, otherwise overcast with one solid day of rain. Temperatures ranged from 20 to 30 degrees C. This was in the second week of August, where it is still very warm. 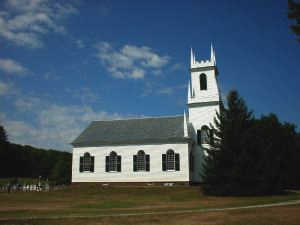 New England also has a "leaf peepers" season a month later, when all the trees erupt in color. Thanks to Sondra Spencer of Rhode Island and others for providing these links.